The RCAF is having a birthday and you are invited! April 1st is the anniversary of the formation of the RCAF in 1924. This year, our sponsors, 443 Wing Royal Canadian Air Force Association, is holding a Wine and Cheese reception on Friday, April 5th. The reception will be followed by a spaghetti dinner for those wishing to stay. The cost for each is a very reasonable $5 for W&C, and $10 for the dinner. The dinner includes spaghetti, roll, butter, desert, coffee or tea. The W&C goes from 4 to 6 pm and the dinner starts at 6pm. The event is held at 443 Wing. Please consider attending this fundraising event and show support for 443 Wing, our generous sponsors. If you would like to attend please call the Wing at 613-284-0305 to RSVP. Hope to see you there! Regular Training – Wednesday’s – 18:00 to 21:00 hrs at 443 Wing, unless noted below. Band – Monday’s – 18:30 to 20:30 at 443 Wing. 03 Apr – COs Parade – Mandatory regular training night – 18:00 to 21:00. Dress C1. Duncan J Schoular School, Smiths Falls. 06 Apr – Effective Speaking Competition – Details will be shared with those participating. 13 Apr – Exertion Competition – Details will be shared with those participating. SAVE THE DATE – UPDATED! Please review carefully. Details to be confirmed. LOTTERY CAMPAIGN – ALL TICKETS HAVE BEEN SOLD! Thank you to all of you who sold your tickets. For the first time in many, many years ALL of our tickets have been sold. In years past, unsold tickets were paid for by the Squadron reducing the return on the lottery sales. This year, we will get the full fundraising benefit! THANK YOU! Congratulations to the draw winners!! Flight date to be announced soon. Proceeds from the Lottery are used to maintain the 24 gliders and 10 tow planes used for Cadet Glider training and familiarization and to support the special provincial events & programs for Ontario squadrons. Approximately 60% of the proceeds come back to us to fund the 585 Sqn training program for 2017-2018. For our local lottery campaign to be a success, we require the cooperation and attentive efforts of our cadets and their parents. A critical aspect of the campaign is the safeguarding and accountability of the monies and tickets as well as their timely return. The books of tickets assigned to the Squadron are a liability to the Squadron whether they are sold or not. Which means that the Squadron pays for lost books of tickets, money that could be better spent on trips or training. As part of the campaign, each cadet and family is asked to sell at least one book of tickets (12 tickets) with total value of $60. Interested in joining the SSC? The majority of the SSC members are parents of our cadets. If you have skills (accounting, fundraising, public relations, website, administrative, or secretarial) you think might be useful to the SSC or simply want to assist in any way possible, please contact one of our SSC members. Read more about the Role of the SSC on the Squadron website. The SSC provides direct support to squadron operations; manages all squadron finances and fundraising activities; promotes honors, awards and trophies – special recognition; provides cadet recreational programs; acts as representative of parents; public relations with the community at large; and arranges annual special events such as mess dinners and the annual ceremonial review. The committee funds make possible supplemental optional activities and programs such as citizenship trips, recreational trips or other training events not funded by DND. 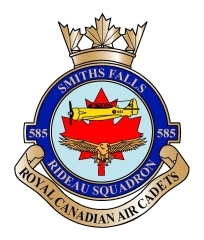 585 Rideau Squadron’s Sponsor is 443 (Rideau) Wing Royal Canadian Air Force Association (RCAFA). They generously host Squadron Headquarters (HQ) for weekly cadet training and on weekends as required, enabling the Squadron to carry out its training objectives. 433 Wing also provides the Squadron an annual monetary grant. Many scholarship opportunities are available from the Air Cadet League and The Ontario Command of The Royal Canadian Legion. Check out the following links to determine if you are eligible. Cadets who meet the criteria should submit complete National Education Scholarships documents in digital form (one PDF file), no later than April 1st, 2019 to: leaguehq@aircadetleague.com. Parade Night: Mandatory – Wednesdays *6:00 to 9:00 pm. * Dress: Uniform C2. Location: 585 Training HQ – 44 Abbott Street, Smiths Falls. Band – Every Monday evening from 18:30 to 20:30 at the Wing. Absence Request: If a cadet is unable to attend training, they must notify 585 Squadron staff by completing the Absence notification contact form on the website OR calling 613-283-9990; otherwise, their non-attendance will be marked as an unexcused absence, which counts against the completion of their training. Replacement Name Tags: If required see the Supply Officer. Uniform: Any issues with your uniform please see Supply ASAP to have it corrected. It is the cadet’s responsibility, not the parents, to maintain the uniform. Check the Squadron website at www.585aircadets.org. All cadets are responsible to check the Squadron website at least once a week for messages. At a minimum, the website Training Calendar and front page messages should be checked on the day preceding any cadet activity for the latest updated information.